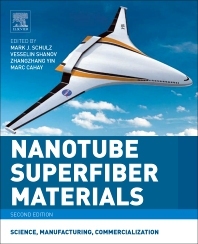 Nanotube Superfiber Materials: Science, Manufacturing, Commercialization, Second Edition, helps engineers and entrepreneurs understand the science behind the unique properties of nanotube fiber materials, how to efficiency and safely produce them, and how to transition them into commercial products. Each chapter gives an account of the basic science, manufacturing, properties and commercial potential of a specific nanotube material form and its application. New discoveries and technologies are explained, along with experiences in handing-off the improved materials to industry. This book spans nano-science, nano-manufacturing, and the commercialization of nanotube superfiber materials. As such, it opens up the vast commercial potential of nanotube superfiber materials. Applications for nanotube superfiber materials cut across most of the fields of engineering, including spacecraft, automobiles, drones, hyperloop tracks, water and air filters, infrastructure, wind energy, composites, and medicine where nanotube materials enable development of tiny machines that can work inside our bodies to diagnose and treat disease. Mark J. Schulz is a Professor of Mechanical and Materials Engineering at the University of Cincinnati, and Co-director of the Nanoworld Laboratories at the University of Cincinnati. The strategic goal of the Nanoworld Labs is to solve societally important and complex problems, to integrate nanotech into university-wide curricula, to interest students to go to graduate school, and to develop new smart and nano materials and devices for engineering and medical use. Mark is a co-founder of two companies based on university technologies. Vesselin Shanov is a Professor of Chemical and Materials Engineering at the University of Cincinnati. He has received several prestigious awards including the Fulbright Award for Research and Teaching in the USA, and German Academic Foundation (DAAD) Grants. His recent research focuses on synthesis, characterization and processing of carbon nanotubes and graphene, with applications in the areas of energy storage, electronics and aerospace. He is a member of the Materials Research Society and co-founder and co-director of the teaching and research facility NANOWORLD Labs at the University of Cincinnati. Dr. Shanov has more than 300 scientific publications, including 16 patents, 12 provisional patents and 5 books, has been cited in about 3,100 different references. Zhangzhang (John) Yin is a Lead Chemist at Ecolab Inc. Previously he worked as the program manager at the NSF Engineering Research Center for Revolutionizing Metallic Biomaterials and Lab Manager in the Nanoworld Lab at the University of Cincinnati. Dr. Yin’s research interest includes corrosion, application of nanotechnology in medicine and water treatment. Dr. Yin received his B.S. from Tongji University and Ph.D. from the University of Cincinnati in Materials Engineering. Marc Cahay is a Professor and Department Head in the Department of Electrical and Computer Engineering at the University of Cincinnati. His current research interests include modeling of nanoscale devices, spintronics, experimental investigation of mesoscopic systems, vacuum micro- and nano-electronics, and organic light-emitting diodes. He has published over 140 journal articles in these areas. With Supriyo Bandyopadhyay, he has co-authored a textbook on an Introduction to Spintronics (CRC Press, Boca Raton, 2008) and a collection of Problems in Quantum Mechanics for Material Scientists, Applied Physicists, and Device Engineers (Wiley, 2017). He is a Fellow of ECS (Electrochemical Society), IEEE, (APS) American Physical Society, and AAAS (American Association for the Advancement of Science).